Hey everyone, I'm excited to bring a podcast interview to you today! We've been publishing coaching calls so much lately that it's been a while since I've had a chance to sit down and actually interview someone. Kevin Petersen is someone that I met about a year and a half ago at a conference called Rhodium Weekend. That conference was geared towards people buying and selling websites, and that is exactly what Kevin is an expert at doing. However, it didn't always start out that way for Kevin. Even though he has always been interested in entrepreneurship, he has a strong marketing and corporate background. The world of buying and selling web properties was completely foreign to him until about 3 or 4 years ago. When Kevin discovers something he goes all in. He jumped head first into buying websites (making his first purchase of a Tattoo related website). Eventually he went on to buy TONS of websites and learned the ropes as he went. He has a VERY strong analytical and marketing background, and so he was quickly able to learn from some of the early mistakes that he made investing in websites and began to see some nice success. He realized that he brought an interesting skill set that others didn't have and decided to try raising funds from others so he could scale his web portfolio. This was the birth of his current business WebfolioManagement.com. During the interview we discuss what he looks for when investing in websites and then exactly what he does to improve the earnings of those investments. In particular, we dive into an example of his most recent investment: PicReel.com. We discuss why he found this asset to be interesting, and what his plans are to increase the earnings. I have a small ownership interest in PicReel.com as an investor in Kevin's fund. So, I've personally invested some money in the business, because I can see the upside potential, but Kevin is actively managing the business, while I remain as a passive investor. If you want to see Pic Reel in action, just go to exit this post or any page on NichePursuits.com. You will see an exit pop that asks for your email in exchange for an offer. This is just one of the functions of PicReel.com. Pic Reel is a cloud based tool. So, you don't have to download anything. It honestly took me about 10 minutes to go from no exit offer on my site to creating it, integrating it with my email auto-responder, and copying and pasting the needed code on my website, to having a live exit offer on my site. 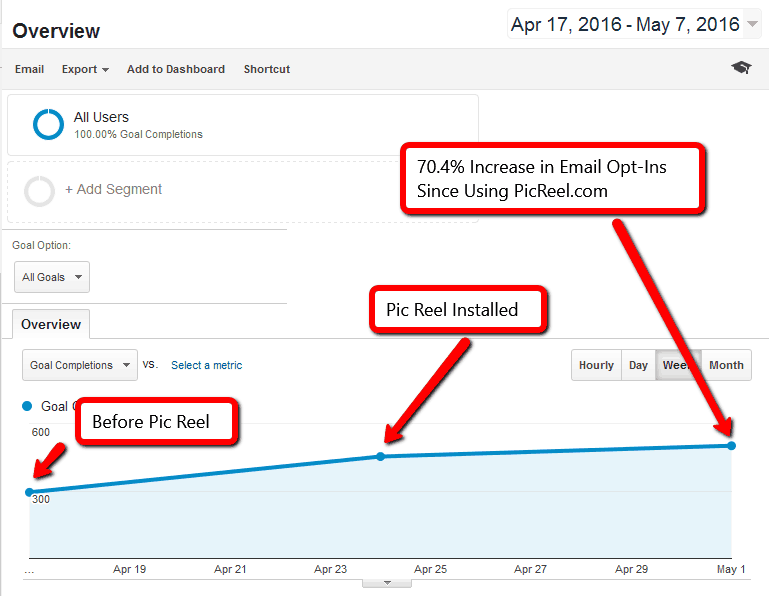 I've seen a 70.4% increase in the number of email opt-ins that NichePursuits.com is getting since using Pic Reel! And honestly, I'm only using the exit offer right now, there are a TON more options with Pic Reel that I plan on trying out in the near future. Before you started buying and selling websites, what were you doing professionally? How did you get started in the online world and investing in websites? When and why did you start Webfolio Management? How does Webfolio work (investors in particular)? Are you willing to share one of your biggest success stories so far? Lots of people listening are actively buying websites or are interested in buying websites. What are a couple of the most important things you look at when evaluating a potential purchase? What are a couple of common ways that you try to improve a business that you purchase? To give people a real life example, I was hoping we could walk through one of your recent purchases: PicReel.com. Where did you find this deal, and what made it attractive to you? What does Picreel do, and how does it help businesses? What are your plans for improving PicReel.com? How long do you plan to hold PicReel.com? And how much do you hope or expect to increase the revenue of the business? What additional advice do you have for people looking to get started in buying and selling websites? Where is the best place for people to get in touch with you or simply follow along with what you are doing? Overall, I hope you enjoy the interview! Constant Contact vs Aweber: Which One is the Right Email Tool for Your Business? Awesome!! Really enjoyed the podcast, Spencer. Picreel is a well established business with significant revenue already (its not new). A couple of big differentiators is that its a cloud based application – its not a wordpress plugin or anything you have to install. This makes it faster and more flexible. Also, its also integrated with MANY more sales/email tools that many competitors. You are correct that the market is competitive, but there is a reason that Picreel has performed so well already and is growing well. Great post and very inspirational. I am also a niche blogger trying to make success online. great post.I enjoyed the proadcast and trying to implement the idea which you shared! Great article! I still read posts from this site for a long time. All articles here are useful ones. I love these. Hi Spencer, always a pleasure listening to your podcasts. Am able to pick up tips and learn new stuff from your podcasts. Great podcast. I really enjoyed it. How did you two end up becoming co-investors together? We met at a conference.